Uta-wa-re-ru-mono. 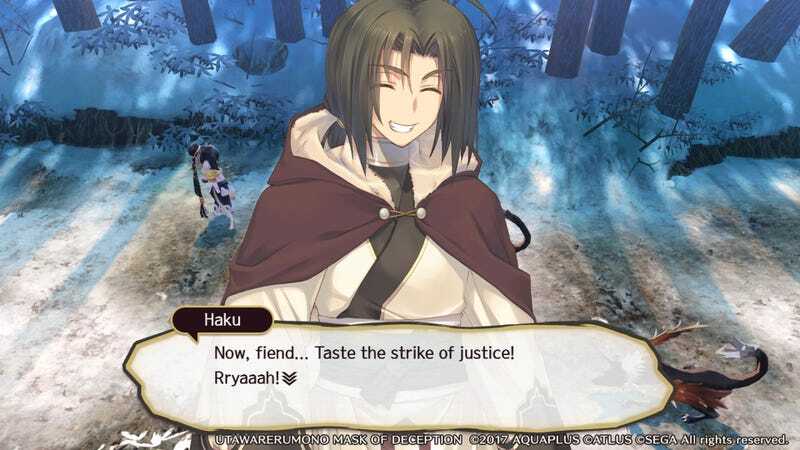 The name of the adult tactical role-playing visual novel series is a bit tricky to pronounce, but I’m sure we’ll have it down by the time Atlus is done releasing Utawarerumono: Mask of Deception and Mask of Truth for North American and European PS4 and Vita this year. Utawarerumono: Mask of Deception and Mask of Truth are the follow-ups to the original Utawarerumono, a combination strategy/visual novel game that took Japan by storm back in 2002. The game spawned manga and anime adaptations, which did manage to make it to the West, so fans of Japanese cartoons and reading from the back of the book to the front might already be familiar with the fantasy world, filled with people with animal ears and tails and political machinations. The first follow-up, Mask of Deception, is due out in North America and Europe this spring for PlayStation 4 and Vita (all physical releases save Euro Vita). It tells the story of an amnesiac (of course) adventurer named Haku, who wakes up in a strange, hostile world. He’s rescued by Kuon, a girl with animal ears and a tail, which is pretty much all I need to know. There’s something about the pair getting mixed up in the political business of the nation of Yamato, which I am sure is nice. Mask of Deception features an active strategy RPG battle system mixed in with all of the anime portrait talking, boasting between 40-50 hours of gameplay. All of those hours go towards setting the stage for the fall release of Utawarerumono: Mask of Truth, another 50+ hour adventure.It all sounds wonderfully exhausting. A brief note on content: While Atlus is committed to bringing over games that are as true to their original forms as possible, in the case of Mask of Deception, a scene had to have a small content edit to comply with various regional regulations about the depiction of physical discipline to minors. We worked with Aquaplus to keep the scope of the editing to an absolute minimum, and we both agree the change made to the scene in the game still conveys its full meaning without running into issues. So yeah, Uta-wa-re-ru-mono. Just work with it. By the end of this year it’ll be rolling off the tongue like Danganronpa.